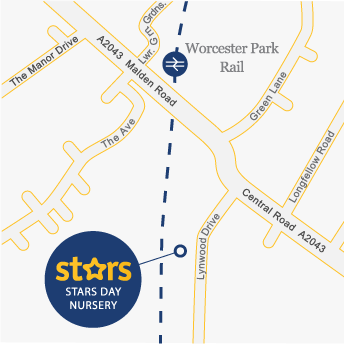 Our Worcester Park Nursery is a detached house popular but quiet area of Worcester Park in Surrey. The nursery is on a quiet road, off the main high street. Being just a 5-minute walk from the station, this nursery is perfect for parents who need to commute in Central London. 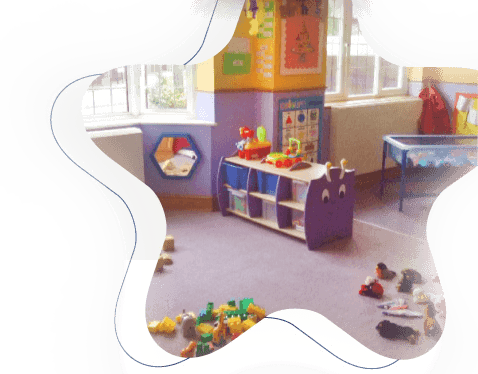 Inside the nursery, we have our Little Stars room for babies and the Rising Stars room for toddlers on the ground floor. Our Pre-School Academy for pre-school children is based on the top floor of the building. All of the rooms are decorated in neutral colours, but we like to use bright and colourful displays for the children’s crafts. Outside, we have a large garden with safety AstroTurf so the children can play safely in the garden during all weather. We also have a ‘snack shack’, a separate area for the children to ride their bikes, a climbing frame and a mud kitchen. We like to let the children play out in the garden twice a day – weather permitting! – so they can get all the benefits of outdoor play. We are just five minutes’ walk from Worcester Park mainline train station (25 minutes to London Waterloo) and public transport links to Epsom and Kingston.